There are painted portraits and photographs of Charles Ricketts, but some moving images of him have been preserved as well. In 1926, Ricketts was filmed while he was working on the rough sketches for the new set of costumes for The Mikado, the Gilbert and Sullivan opera. This promotional film of the D'Oyly Cart company can be seen on YouTube. The title of the film is 'The Mikado redressed in 1720 Period Costumes', and it contains 'exclusive pictures in colour' of 'the new designs by Mr. Charles Ricketts, A.R.A.'. 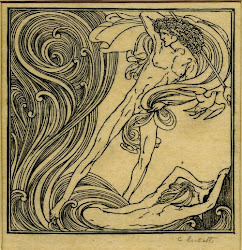 There are images from several scenes in the opera. After circa 3 minutes a text announces images of 'Mr. 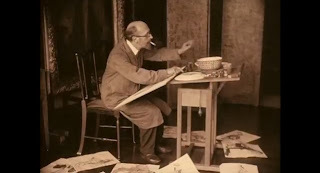 Charles Ricketts, who designed the costumes, at work on the rough sketches'. He sits at a table, with a sketch board in his lap, and a cigarette in the corner of his mouth. The floor is scattered with designs. Next, we are informed that 'the famous artist has no use for an ash tray', as he uses a bowl of water for cleaning his brush as well as for extinguishing his cigarettes. An assistant picks up the bowl of dirty water and several cigarettes, and also an almost unused ash tray, and provides the artist with a bowl of clean water, in which he immediately cleans his brush before throwing in another cigarette. 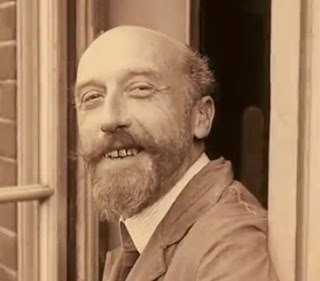 Then a wall with fourteen sketches comes in sight, followed by a close up of Ricketts on the balcony of his studio during a break. He talks to the camera, alas, the words are not recorded (we need a lip reader for that). Then he takes off his glasses, and laughs, uncovering his rather bad front teeth. Ricketts was almost sixty at the time. Although the whole sequence does not take longer than about a minute, it is of course touching to see him alive.